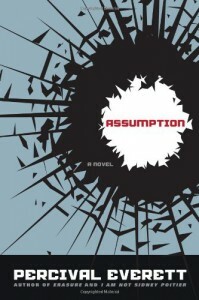 Assumption is a very different novel in style, voice and ostensible subject than the other Everett novel I recently finished, Erasure: A Novel. It is at least as good, if not better, in my opinion. It's made up of three novella-length stories tied together by the character of Ogden Walker, a deputy sheriff in a rural New Mexico county, and the problem of finding out who we are. In Ogden's case, the answer is terrifying. I really can't talk about the book without spoilers. As other reviews have mentioned, everything you thought you understand from the first two stories is turned on its head. In the two novels of Everett's I've read so far, one of my favorite aspects is that he doesn't lead the reader to a conclusion but leaves enough clues for you to work things out for yourself, if you want to take the trouble. If you don't, Assumption still works as a mystery (at least the first two stories). Some might find the novel contrived but it worked for me so I'm going to recommend it even more strongly than Erasure.